Gary Paulsen was born in 1939 in Minnesota. He didn’t do well in school as a child, but loved to read. As a young man, he had many jobs, including being a construction worker, a truck driver, an engineer, and a satellite technician. Paulsen took a job as a proofreader in order to practice his writing craft. His first book was published in 1966. He has since published over 200 books. Paulsen returned to live in Minnesota when he began writing. There he has been involved in many outdoor activities, including dog racing. He participated twice in the Iditarod, a grueling dog sled race of over 1,000 miles. Paulsen does a lot of research for the books he writes. Many of the stories he has written come from personal experiences he has had in the wilderness. 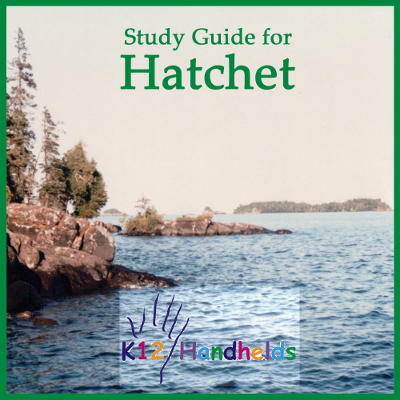 In an ultimate tale of survival, Hatchet by Gary Paulsen, tells the story of a young boy marooned in the wilderness. Alone in the woods, he faces an amazing amount of obstacles. After his plane crashes and the pilot is killed, Brian finds himself alone with few supplies. He summons his knowledge of survival skills, mainly gathered from various television programs, and proves to himself that he is able to survive. He learns he can rely on himself to be strong. 1. Look at the illustration on the cover of this book. What details do you notice? 2. Predict how a hatchet might be a part of the story. 3. Read the information on the back cover of this book. What genre do you think this book is? 4. How old do you think the main character is? 5. What does it mean to be a survivor? 1. Why is Brian is upset at the beginning of the story? A) He has to change schools. B) His grandmother has just died. C) His parents have recently divorced. D) His family is moving to Nebraska. 2. What causes the plane to crash? A) The pilot lets Brian fly the plane, and he crashes. B) A violent storm forces the plane down. C) The pilot has a heart attack and is unable to fly. D) There is a problem with the engine. 3. Where did the plane crash? 4. When the plane is flying without the pilot, what does Brian decide to do? 5. Why did Brian take the headset off the pilot? A) He wanted to try to communicate with someone. B) The headset cord was choking the pilot. C) He thought the headset would give him instructions on flying the plane. D) He thought that the pilot might wake up if he was disturbed. 6. As the plane comes crashing into the lake, who begins screaming? 7. Have you ever been in the position where someone was in danger and you were unable to help them? Use this experience to tell how Brian might have felt while the pilot was having a heart attack. 8. At the end of the first chapter the author uses the word “alone” three times. In what ways was Brian alone? 9. Why did Brian’s mind plead with the pilot to “…be asleep and your eyes will open now and your hands will take the controls and your feet will move the pedals…”? 10. When it came to landing the plane Brian was left with two options. What were these options, and which one does Brian choose? 1. What does the “Secret” in the book concern? 2. What is Brian’s worst injury after the crash? A) His ribs are broken. B) His leg is broken. C) His arm is broken. D) His head is hurt. 3. What is one of the first obstacles that Brian is forced to face? 4. What inspires Brian to create a plan of survival? A) His father hates it when people quit. B) He is inspired by the boy scout motto. C) He does not want to disappoint his mother. D) He remembers a teacher who taught him to think positively. 5. Compare and contrast the wilderness to the city by creating a Venn diagram or a two-column chart. 6. How do you think Brian will have to change in order to adapt to his new surroundings? 7. The book says that “Nobody had ever told him if you could or could not drink lakes.” What do you learn about Brian from this statement? 8. What movies or TV shows have you seen that might help you if you were in Brian’s situation? Describe things you have already learned about surviving. How does Brian’s knowledge gained while watching TV help him? 9. What did Brian remember his English teacher Perpich always talking about? How did this help him? 1. What kind of shelter does Brian sleep in? 2. Why does Brain call the berries he finds “gut” cherries? A) He is excited to find food finally. B) They cause him to become ill.
C) He doesn’t like the way they taste. D) He thinks they are delicious and satisfying. A) He is trying to focus and keep things simple. C) He is explaining the situation to someone else there. D) He thinks he will forget who he is. 4. Why does Brian’s reflection in the water upset him? A) His face has become grotesque and unrecognizable to him. B) His face is bleeding uncontrollably. C) His face resembles his father and causes him sadness. D) He has lost so much weight. 5. How did Brian find the berries? A) The bear led him there. C) He followed a trail. D) The birds led him there. 6. While Brian is picking raspberries, what does the bear he sees do? 7. If you were stranded in the wilderness, what things would you need to worry about right away? What skills would be most valuable to have? 8. If you were alone and stranded somewhere, how would you keep from panicking or being sad? What would you do mentally to survive? 9. What is the secret that Brian knows that he believes his dad does not? 10. Should Brian be afraid of the bear? Did the bear do anything that would make Brian believe he was in danger? Why do you think Brian remains frightened of the bear? 1. What makes a slithering sound in Brian’s lean-to and then causes him great pain? 2. What does Brian often have flashbacks about? 3. What is the only tool that Brian had carried with him? 4. How does Brian first think of the fire he builds? 5. What food does Brian find to eat at the end of Chapter 10? 6. What are the different ways Brian tries to make fire? What eventually works for him? Describe the process he uses. 7. Brian reflects on how “things change so fast.” Give two examples from the book about how Brian’s situation changes so fast. 8. Explain how Brian changed since the crash. 1. What scares Brian in the woods, seeming to blow up like an explosion? 2. What does Brian do, when he sees the rescue plane fly away without seeing him? 3.What becomes a part of Brian? 4. What did Brian use for a string for his bow? 5. How does Brian decide to store fish? 6. What does Brian realize about the seriousness of making mistakes when trying to survive in the wilderness? 7. Describe the different ways Brian tried to catch fish. 8. What was the moment Brian believes he died and was born again as the new Brian? What happened to change him so much? 9. Brian says, “I am full of tough hope.” What does he mean here? What do you think “tough hope” is? Have you ever had tough hope? 10. How is Brian’s idea about mistakes different now that he is living out in nature versus living in the city with his parents? 11. How did learning how to hunt for meat change Brian’s thinking about survival and life in general? 1. What animal charged Brian and threw him into the lake, hurting his ribs badly? 2. What destroyed Brian’s lean-to? 3. When the storm unveils the airplane wreckage, what does Brian decide to do? 4. What is the first thing that Brian does after the tornado? A) He tries to find food. B) He rebuilds his shelter. C) He makes a fire. D) He writes a letter to his mom to tell her that he is no longer upset. 5. How does Brian make the raft? A) He uses rope from the plane. B) He uses his belt to hold the logs together. C) He weaves branches together with flexible limbs. D) He ties them together with his shoelaces. 6. What three big things happen to change Brian’s situation in chapter 16? The first two would have caused Brian to give up after the crash, but now he is “tough in the head.” What attributes has he acquired to make him tough in the head? 7. In chapter seventeen, Brian works hard to get to the submerged plane, because he says if he gets the pack he will be “so rich.” What does Brian mean about getting rich? 1. What does Brian learn is his best tool for survival? 2.What happens to the hatchet when he is using it to open the plane? A) He breaks it in half and can’t use it anymore. B) He drops it, and it falls to the bottom of the lake. C) He cuts himself and cannot stop the bleeding. D) It falls into the bottom of the plane and can’t be retrieved. 3. Why did Brian hope that the emergency transmitter was a radio? A) He missed listening to music. B) He missed human voices and sounds. C) He wanted to know the upcoming weather report. D) He thought he might hear news about the crash. 4. What happened as Brian sat down for his first “real” meal? A) He was stung by bees. B) A tornado hit and destroyed the meal. C) He decided that he was an excellent chef. D) A plane landed to rescue him. 5. How many days had Brian survived in the wilderness before he was rescued? 6. What did the “gut” cherries end up being good for, and what were they called? 7. Why was the rescuing pilot in the area? A) He was mapping Cree fur trapping camps. B) He was hired by Brian’s father to find Brian. C) He was training to get his pilot license. D) He liked to fly on the weekends for fun. 8. What did Brian try to tell his father, but was never able to? A) Survival depends upon owning a hatchet. B) Adversity can teach us about ourselves. C) A person’s most important comfort is their parents. D) Being alone can be easy. 10. List at least five items that Brian found in the survival pack. 11. Which item from the survival pack do you think was the most valuable and why? 12. In Chapter 19, the books says, “The rifle changed him, the minute he picked it up, and he wasn’t sure he liked the change very much.” What was the change he felt, and why did he not like the change? 13. After Brian returned home, he learned about some of the things he experienced in the wilderness. What did he learn that was most interesting to you? 1. Draw a storyline for Hatchet. Make sure to show events in the rising action, the climax, and the resolution. At the bottom, list the elements of setting, as well as the main characters. 2. What are some ways Brian changed as a result of this adventure? Which change do you think mattered the most in his life afterward? 3. Did you find the story ending satisfying? What would you have changed if you had been the author? 4. Write an alternative ending to the story in which Brian is not rescued. Instructions: Choose the best word to complete each sentence. 1. I had a ___ in my back that made me yell in pain. 2. The water was ___ out of the hole in the plastic bag. 3. Jacqui was ___ in her misery; she couldn’t move on. 4. The ___ of the engine could be heard. 5. The basketball player ___ his knee during the game. 6. The water ___ down the drain. 7. He ___ in pain after falling down the stairs. 8. The plane hit some ___ that felt like we were on a roller coaster. Instructions: Choose the word that matches each definition. Instructions: Choose the best word for each question. 1. Which word means the same as abated? 2. Which word is a synonym for crushed? 3. Which word means to stuff oneself? 4. Which word means the opposite of joyful? Instructions: Choose the best word to complete each of these sentences. 1. The small ___ of the plant helped it climb the wall. 2. The price of the new car was ___. 3. Which ___ of the story did you like best? 4. When Juan couldn’t solve the problem, you could see the ___ on his face. 5. The new mother thought her baby was the most ___. 1. The tool Brian made to catch fish was a two- crude exulted flailing hefted infuriating lunged persistent prong spear. 2. When Brian crude exulted flailing hefted infuriating lunged persistent prong the spear, it seemed effective. 3. He tried everything except crude exulted flailing hefted infuriating lunged persistent prong the arrow to catch the fish. 4. Brian crude exulted flailing hefted infuriating lunged persistent prong in the successes he had in catching fish and birds. 5. Trying to catch the fast moving fish was crude exulted flailing hefted infuriating lunged persistent prong . 6. Brian crude exulted flailing hefted infuriating lunged persistent prong in the water many times, trying to catch fish. 7. The tools Brian made were crude exulted flailing hefted infuriating lunged persistent prong , but they worked. 8. It was exciting to hear the crude exulted flailing hefted infuriating lunged persistent prong whine of an airplane motor. Instructions: Choose the best synonym for each word. Written by Bonita DeAmicis, Karen Fasimpaur, Cindy Hallman, and Amy Panama.